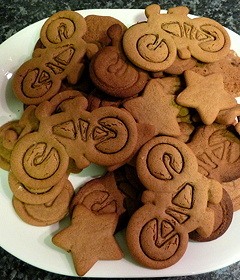 Here are some of the recipes that have been used for cakes and biscuits that our helpers have brought along to our bicycle maintenance workshop. Enjoy! 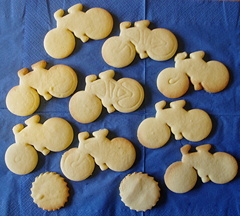 Roll out dough on floured surface and cut out bicycles (bicycle-shaped pastry/biscuit cutter found on eBay) - see detailed cutting instructions of our technique. Bake at 180°C/350F/Gas mark 4 for about 40-45 minutes, until a skewer stuck into it comes out clean and/or it shrinks away slightly from the side of the tin. Glaze: Dissolve sugar and lemon juice over low heat until sugar is disolved. Boil for 1 min. Pour over hot loaf. Grease and line a 2lb loaf tin and pre-heat oven to 180°C/350F/Gas mark 4. Leave in tin for 10mins then cool on rack.